With Seasonal Changes and the kids going back to school our immune systems can take a big hit! Souls Center is proud to support the one and only Fiery Red-Head Katie Carey and Her Home for Healing Arts. Katie is a master tea and tincture maker. Her all natural products are a wonderful alternative to support health and well-being. Katie offers a variety of loose leaf teas to reduce stress, and boost the immune system. ​If tea isn’t your thing, then perhaps an herbal bath soak. Katie makes glorious herbal tea bag soaks and scented bath salts. Did I mention the artisan soaps that are also available? All these items and more are available in the Souls Center Classroom. 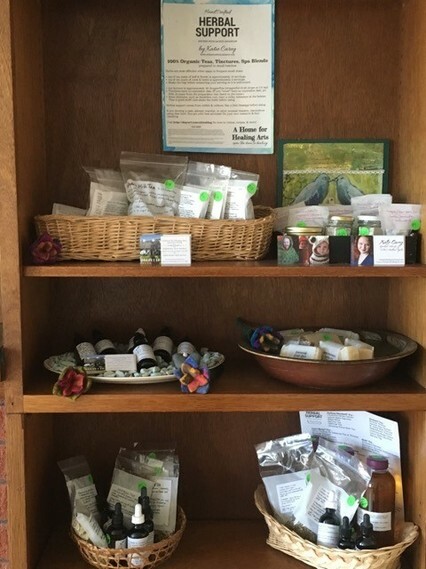 ​Souls Center is proud to offer Gerrie Margell’s all natural creams infused with essential oils. They are just the thing for the drying months of fall and winter now upon us. Gerrie also offers an elixir called Motherwort, which is a calming blend in 1 or 2 oz bottles. Stop by and check it out.